Looking for SEO statistics 2019? 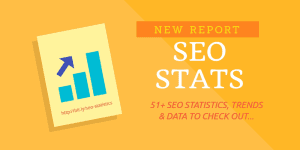 In this report, you’ll find the latest and the greatest SEO statistics, search engine marketing stats and SEO facts and figures for 2019. Search engine optimization (or SEO) is ever changing and so are the SEO facts and figures that are based around these. It is very important to know how the trends are shaping, what are the numbers of the game and how consumers are using search to find information online. … I’ve got your back covered with this ever-updated google search statistics report. 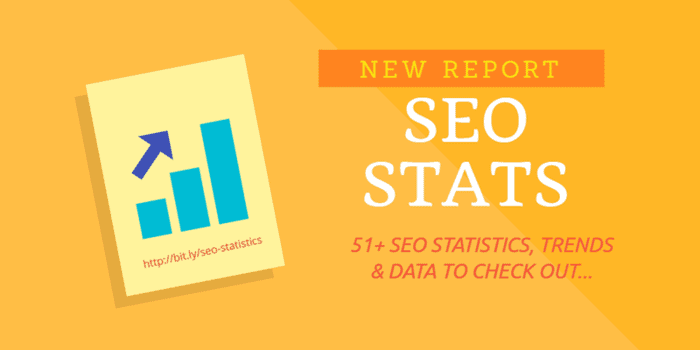 Feel free to use these authentic SEO stats & research data to back up your articles, client pitches & social media updates. I spent considerable amount of time (every month) in researching, collecting & validating these information so they stay updated & relevant to the SEO industry. I would appreciate if you could link back to this page when using a SEO fact in your work. Cheers! Including a video in a post increases organic traffic from search results . 1 in 10 blog posts are compounding, which means their organic search traffic increases with time. According to Ahrefs, 90.88% of all pages (from an index of 1 billion pages in their content explorer tool) receive no traffic at all and only 4.5% of them get less than 10 visits per month. 1) What is the latest search engine market share and who holds the largest market share? Google currently holds 78.01% of the search market share With Baidu 9.1%, Bing at 7.16% and Yahoo at 3.63%. 2) What percentage of total shares does Google Properties own? While Google tops the list of best search engines, search engine optimization is not only about it. So, here’ a SEO fact about Bing & Yahoo! 3) What is Bing & Yahoo’s search engine market share? Bing and Yahoo’s combined searches went down from ~7% (in November, 2015) to ~4.6% in February, 2018. A study by Forrester reveals that about 93 of all online experiences begin with a search engine, Google being the king. It’s a convincing Google SEO statistics that shows that if you want more sales, or stay in the minds of your readers, you need to be investing in search engine optimization (which is easy and effective) and paid search ads (requires some investment). 4) What is the number 1 referrer of traffic in the world? Google is the number one traffic referrer in the world not only with SEO but also as compared to other platforms like social media. 5) What type of content receives more shares and links than other formats? A study of over 1 million articles reveals that high Quality, long form content (over 1000 words) which constitute only 15% of total content (videos, articles, quizzes etc) receives more shares and links than other formats. 6) What is the average word count of first page results in Google? The average Google first page results contains 1890 words. 7) What are the top 3 Google ranking factors? Links, Content and Rankbrain are the top 3 ranking factors for Google’s search. (~Andrey Lipattsev, Search Quality Senior Strategist at Google). 8) What percent of users never crawl past the first page of Google? A research from HubSpot shows 75% of users never crawl past the first page of search results. 9) What is the reason for decrease in organic traffic? Day by day, more results are directly displayed on the search pages thereby decreasing the amount of organic traffic to sites. 10) Mobile searches vs Desktop searches Who’s the winner? Mobile searches dominate over desktop searches in about 10 countries including US and Japan. 11) What is the correlation between total shares and referring domains? The same study reveals that the correlation of total shares and referring domain links across 750,000 articles was just 0.021. 12) What type of blog post types get more backlinks or referring domains? Link posts and why to posts have a higher chance of referring domains than others. 13) What are the most effective SEO tactics in 2019 (and what SEO tactics are the most difficult ones to achieve)? Content creation is the most fruitful (with 57% SEOs believe content creation drives the best results) for SEO in comparison to other SEO tricks. Other effective search engine optimization tactics include keyword research (49%) and social media marketing (39%) and link building (at 36%). Similarly, it is also the most difficult SEO tactic to achieve (with over 46% of votes) followed by ink building and keyword research at 45% and 35% respectively. Organic CTR for desktops have decreased from 71.57% to 65.72% in between 2015 to 2018. Paid CTR has seen a minute increase in performance from 2015 (3.38%) to 2018 (3.82%). Clicks on mobile are ~50% of what clicks on desktop are. Paid CTR on desktop vs paid CTR on mobile (3.82% vs 3.12% in February 2018). Difference of organic CTR (desktop vs. mobile) is pretty high (66% vs. 39%) and the drop of organic CTR on mobiles is a matter of concern for SEOs focusing on mobile. 15) How many google searches are performed per second? Google receives over 69,663 searches every single second. This is one of the best eye-popping statistics on search engine marketing that you can use to convince anyone skeptic about spending in SEO & SEM. 16) How many Google searches per day? According to Internet Live Stats, over 6 billion Google searches are performed per day (6018883200 searches to be exact). 51% of all search traffic comes from organic search, 10% from paid search, 5% from social and 34% from all other sources. 18) Does SEO has a positive ROI? What is the top goal and top barrier in SEO campaigns? Over 81% of participants (in a research from Ascend2) report their SEO campaigns are above average. The top goals of SEOs (participants) from their SEO campaigns were to generate traffic and the top barrier was to improve or get decent search engine rankings. Recommended Reading: 40+ Instagram Statistics that shows how the market is changing! 19) What percentage of search queries did Google Panda affect? Google Panda (2011) affected 12% of total search queries. 20) What percentage of search queries did Google Penguin affect? Google penguin (2012) impacted 3% of all search queries. 21) What percentage of all mobile and tablet search traffic comes from Google? 92% of all mobile and tablet search traffic comes from Google. 22) What percentage of desktop search traffic comes from Google? Taking the above mobile SEO data stats, it’s clear that 8% of all desktop search traffic comes from Google. 23) How percent of mobile search traffic is from Google? Google drives 96% of Mobile Search traffic, followed by Yahoo at 2% and Bing with 1%. 24) What percent of all web traffic is actually from mobiles? Mobile accounted for 52.2% of all web traffic in 2018. This went up from 0.9% in 2009. 25) What percentage of all Google searches are voice searches? In the Google app, 20% of total searches are now by voice. 26) What amount of mobile searches are location based queries? Nearly 1/3rd of all mobile searches are location based queries. 27) What percentage of smartphone users are comfortable with researching, booking, planning their entire trip to a new travel destination using only a mobile device? 28) How has the mobile search trends around the keywords “best” and “do I need” changed recently? Mobile searches for “best” have increased by 80% in the past two years. Mobile searches for “do I need” have grown over 65%. For example, “how much do I need to retire,” “what size generator do I need,” and “how much paint do I need”. 29) What do users expect from a business before buying from them through mobile? Compared to a year ago, smartphone users are more likely to purchase something from companies whose mobile sites or apps customize information to their location. Over 73 billion phone calls will be generated from mobile search alone by the end of 2018. 31) What percent of online shoppers use their mobile phones to shop online? About 11% of online shoppers use mobile phones to shop online and 35% of shoppers say mobiles will become their main purchasing tool. Liking the mobile SEO usage statistics for 2019 so far? You’ll love the eCommerce and voice SEO stats that can help you create effective SEO campaigns. 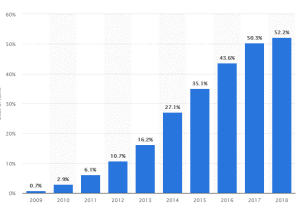 32) What will be the global retail eCommerce sales trend by 2019? A 2018 report by Shopify Plus estimates that, by 2021, global retail eCommerce sales will reach $4.5 trillion. 33) What are the top shopping activities online? Information gathering and deal seeking are the top shopping activities online. Leads from search engines (inbound marketing) have a 14.6% close rate while outbound leads (direct mail, cold pitch) have a 1.7% close rate. This SEO statistics about eCommerce tells us heaps about SEO effectiveness for CRO. 35) How does having videos in landing pages effect conversions? According to a report by Wordstream, using videos on landing pages can increase conversions by 86%. 36) What percent of US small businesses do not have a website? Despite the eCommerce industry showing a 23% year by year growth, 46% of American small businesses do not have a website. According to Google, businesses with a website get 25%-35% more clicks. It makes sense to have a website for your business. Here’s a step by step guide on how to start a blog if you do not already have one. On a side note, here are 21+ blogging benefits that non bloggers might be missing out to website owners. 38) What percent of consumers visit a retailer after performing a local search? 72% of consumers who performed local search visited a local search visited a retailer within 5 mile radius. 39) What percentage of consumers look for directions and call buttons in ads? If you’re wondering the importance of having directions and call buttons in ads you’ll be glad to know that 7 out of 10 consumers say it is important to have a directions and a call button in ads. 40) What percent of local searches lead to a purchase as compared to non-local searches? 18% of local smartphone searches led to a purchase within a day compared to 7% of non-local searches. 41) What percent of mobile searches are location-based queries? According to Google, 33.33% of all mobile queries are location based queries. 42) Do consumers use local information in ads? By What percentage? 43) What do smartphone users mostly look from local business in order to purchase something? As compared to last year, smartphone users are more likely to purchase from companies that customize their mobile sites or apps to have location-specific information. 44) 50% of all searches will be voice searches by 2020! 45) Another mind-blowing voice SEO statistics by Gartner reveals that by 2020 almost 30% of all searches will be done without screens. 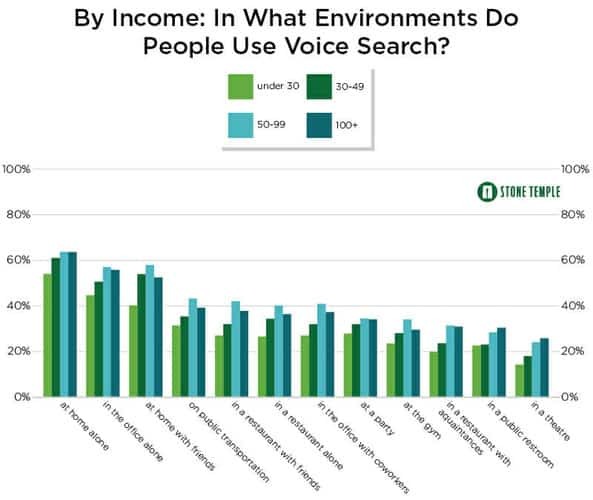 46) What is the average income of people who use voice search the most? A recent research shows that in 2018 people who make $50k-$100K were the most likely to use voice commands (41.5% in aggregate across all environments). Last years’ most voice search users (of the $100K+ category) closely followed them (39.4%). 47) Parents vs non-parents: who uses voice searches the most? 72% of parents said they are likely to use voice-activated speakers to buy something in the next month which is 21% higher than what non-parents said (51%). 48) What are the top 5 things parents ask their children to do with voice-activated speakers? 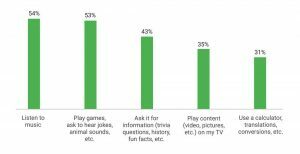 49) What is the top reason for using voice-activated search device by consumers above 55 years? 51% of those 55 years old or more said the top reason for using a voice-activated search device is because it empowers them to instantly get answers and information. 50) What percent of millennials use voice search before making a purchase online? 40% of millennials use voice search before making a purchase online. 51) What percent of voice search results have the exact keyword in the title tags? Contrary to the popular belief about voice SEO search results, only 1.71% of the voice search results had the exact match keyword in their title tag. 52) What type of content (long form or short form) ranks well in Google home search results? In the same voice SEO research stats article (as above) it was found that long-form content tends to rank well in Google home search results. 53) Do featured snippets impact voice search results? Yes, having featured snippets for your website increases your chances to rank for voice search results for that particular query. 54) Does video improve SEO? Yes, video does improve SEO. According to a research, videos help you to get 157% more organic traffic from search engines, 105% increase in time spent on site, and 2x overall conversions compared to non-video content strategy. Another research by Wistia, shows people spent on average 2.6x more time with pages with videos (7 minutes 21 seconds) that those without (2 minutes 48 seconds). BONUS: How To Rank For Voice Search SEO Results On Google Home? Now that the latest voice search usage statistics show you how it can help you optimize your websites for more sales, you might want to optimize your site for voice search SEO. So, with this let’s wrap our SEO usage statistics! I hope you liked the latest SEO facts and stats for 2019. Search is seeing a substantial year on year growth and has a greater ROI than most traditional and paid marketing channels. Voice search usage stats coupled with eCommerce SEO stats show how you can tap into a profitable zone by better understanding how consumers use and how their journey shapes using search marketing. If you liked these search engine usage statistics, feel free to use them in your articles, presentations or to create a winning SEO campaign. What SEO stats and figures did you like from the above? If you’ve a latest SEO fact or interesting facts about SEO that you’d like to share, feel free to comment below.